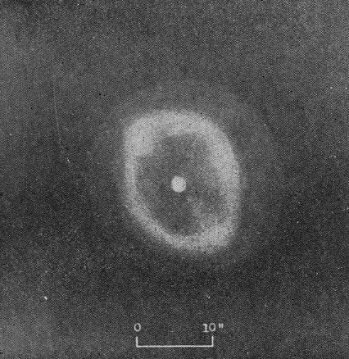 "Sharp stellar nucleus...surrounded by an elliptical ring...Outside this is an oval disk of fainter matter" [Curtis]. Bright but understudied, NGC 2022 (with no popular name) lies in a prominent part of northern Orion just 1.8 degrees southeast of the luminous class O star Meissa (Lambda Orionis). 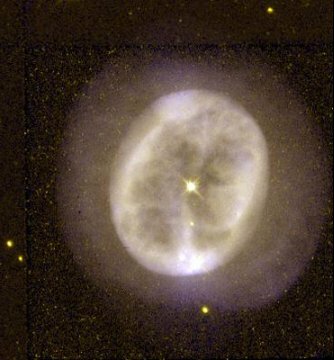 Curtis (whose composite drawing is on the left) has captured not only the essence of the planetary nebula, but also many of the subtleties, as seen by comparison with the Hubble image on the right. Rotate the Hubble picture 40 degrees to the left to align the two and place north to the top. Like many others -- best examples would be NGC 3242 and NGC 7662 -- NGC 2022 is a classic double shell object, the inner one apparently compressed by a fast wind from the mid-sixteenth magnitude central star. As usual, the distance is highly uncertain. At 8000 light years, the inner shell (20 seconds of arc in diameter) is 0.8 light years across, the outer 1.1 light years (which seems high, suggesting the distance is overestimated, perhaps considerably). Leakage of ionizing stellar radiation from the double shell then reveals a huge outer envelope with a diameter 88 seconds of arc -- more than three light years -- that is probably what remains from much earlier mass lost by the star. The chemical composition seems more or less of the solar variety with no particular enhancements, though one study suggests high a high carbon content. As the inner nebula expands at a rate of 26 kilometers per second, the hot star (estimated at 108,000 Kelvin) is probably still in a heating state (the high temperature resulting in abundant doubly ionized helium), though it is probably also near the point of maximum heating, after which it will cool and dim as a nascent white dwarf. Left: Image by H. D. Curtis from Publications of the Lick Observatory, Volume 13, Part III, 1918. Right: Howard Bond (STScI) and NASA.